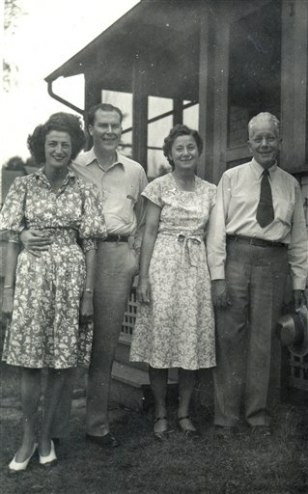 This undated photo provided by the Dunham family shows Ralph Emerson Dunham, second from left, his English wife Elizabeth "Betty" Smith Dunham, during their honeymoon visit with his maternal Aunt Doris Armour, third from left, in Kansas after World War II. The man at right is an unidentified friend. Dunham, later became the great uncle of Barack Obama.